Soon the tykes and teens of Prince William County will head back for a new school year and the logistics of life for their adults will be complicated by bus schedules, snow days, after-school events, car shuttling, etc. Thankfully, technology can make some of the issues easier. The Prince William County School website (www.pwcs.edu) has a plethora of information from bus schedules, meal plans and much more. Parents should sign up for the Parents Portal to better stay on top of their child’s school lives and communicate with the schools and teachers. The parent’s page has a lot of valuable information. Even if you’ve been shepherding your kids though the district for years, it doesn’t hurt to review the information on these pages. The same is true for the student’s pages for both students and parents. There is valuable information there. The one critical page you must visit allows you to sign-up for email and text alerts. News of school closings for weather and other issues can come directly to your phone. The link for that and the other resources talked about are at FamilyTechOnline.com in this week’s link post. As with much in life, sending your kids off to school requires you fill out a lot of paperwork. Take a second before sending filled out forms back to school, to take a photo of them with your phone so you have a copy you can refer to wherever you might be. If you have an Android phone, you might want to consider downloading Google’s Keep app. It is a simple, easy app to store photos, lists and notes and makes them easy to find later. Unfortunately Keep is not available for iPhones. Evernote, my favorite app, runs on iPhones as well as Android. It also lets you store paperwork, photos, notes and more on your phone to make it easier to find later. What do you use for calendaring? If you are a parent, your kids keep you running in all directions with after-school activities, deadlines, sports, scouting and more. A good calendar – be it paper or electronic – helps. If your kids are old enough to have their own smartphones, a shared family calendar is handy. With Google Calendar, for example, you can create a family calendar for vacations, relatives’ visits and the like. Each child can also add their own events to the family calendar so parents can be aware of where they are, or when they might need transportation or parental involvement. 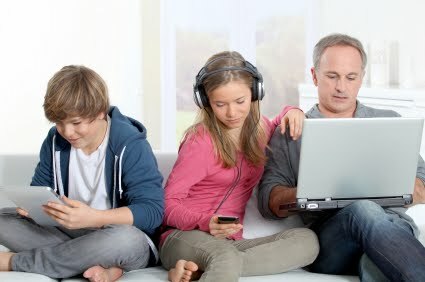 Once your children have their own phones, family communications is a bit easier. Hopefully your plan has unlimited texting since kids text a lot. And, it is handy for parent/child communications. Urge your smartphone-equipped child to calendar their assignment deadlines. Beyond that, there are apps for tracking homework assignments and other scholastic efforts. Getting the discipline now to use them will make college easier. There’s a Comcast ad that says 95 percent of kids use the internet to do their homework. That means 5 percent don’t. They could be working smarter if they had the availability. If it’s a matter of affording internet, Comcast has its Internet Essentials program. It allows a family with at least one child eligible for the free lunch program to get internet access for $9.95 a month. For homework help, teachers will have their own recommendations for the best online sources to augment their teaching. One site that has a great reputation is Kahn’s Academy. It’s a free site with videos and other learning resources for a host of subject matters covering from kindergarten through college. Sometimes a student just needs another explanation of a concept from another angle. Kahn’s can offer that alternative. Note: While Mark is an employee of Prince William County Schools, the suggestions and comments in this column are entirely his own.